Defenders of Steve Bannon and his campaign of hate argue that he has the right to speak under Canada’s Charter of Rights and Freedoms. They say free speech means everything should be on the table and a good debate will determine which ideas are right and which are wrong. That’s the argument in today’s Toronto Star, headlined “Don’t Fear This Debate”. But it’s the Toronto Star that’s wrong. The ideas that Bannon promotes are racist, xenophobic and misogynist. They are intended to stoke feelings of hatred and fear against immigrants and especially Muslims and racialized peoples in Canada. This is hate speech and it’s illegal in Canada. Bannon is not here to exchange ideas about hate. He’s here to build a movement that’s based on hate. Bannon is here to unite the growing number of hate groups that exist in Canada, and link them up with hate groups in the US, Europe, Latin America and wherever they exist. This is criminal activity and it’s illegal in Canada. 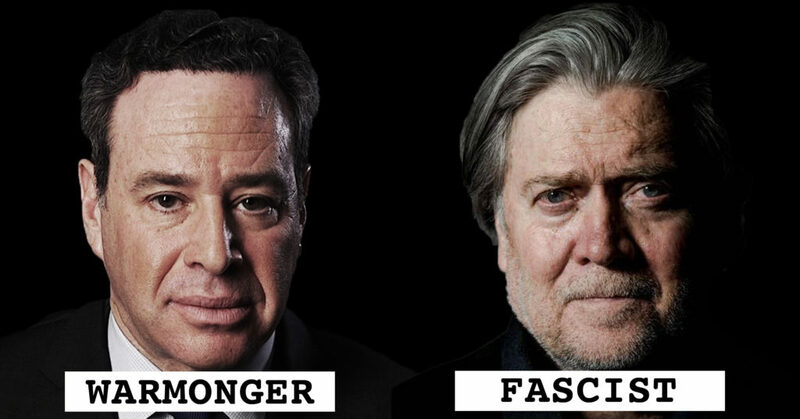 David Frum has a lot in common with Bannon. In fact this debate is more of a discussion between two racists, one of whom is a fascist organizer and the other a war-monger. 20th century history is rife with examples of where hate speech and organizing leads. The genocide of millions in Nazi concentration camps, and the killing of millions more in World War II is the horrific consequence of fascism in full flower, elevated to state power. In Europe, the US, and Canada we are already seeing fascist mobs, attacks on racial and religious minorities, and murders carried out or motivated by hate and by the ideas and the organizations advocated and supported by Bannon. This has nothing to do with democracy and free speech. This is about hate. The murders in a Quebec mosque last year, the murders in a US synagogue this week, and the arson at a Toronto refugee hotel last month are what hate speech and organizing generates. The defence of democracy and free speech demands that Canada’s hate speech laws be rigorously enforced by government and police, and that stiff penalties for hate speech and organizing include jail time. This must also include defence of the free speech rights of people targeted by Bannon and hate groups.